The PLANET POE-2400G is 24-Port Gigabit IEEE 802.3af PoE Web Management injector Hub and complies with IEEE 802.3, IEEE 802.3u, IEEE 802.3ab and IEEE 802.3af standards. 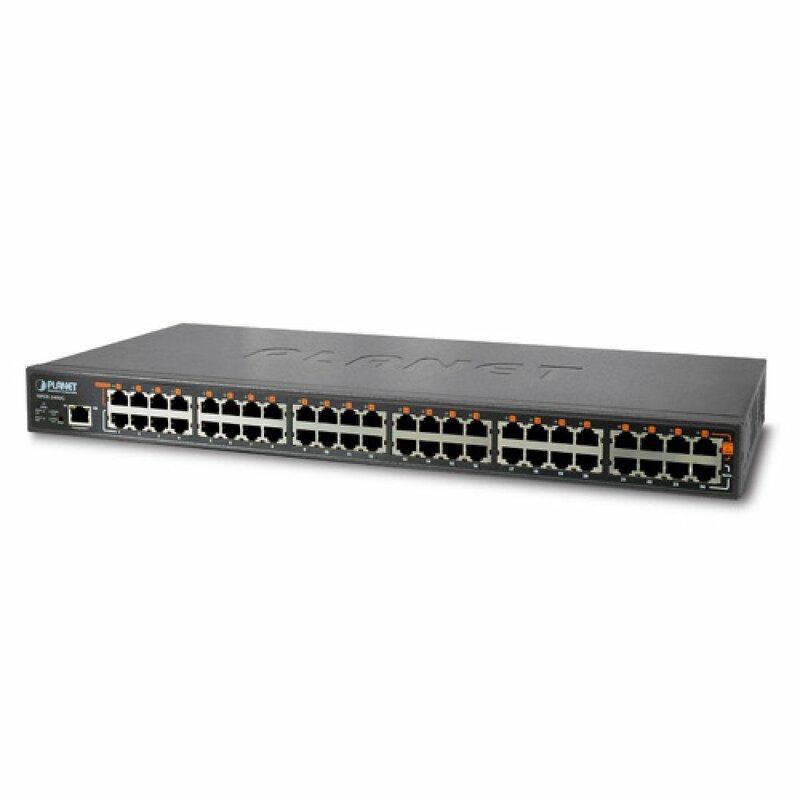 With 24 10/100/1000Base-T Gigabit Ethernet ports, the POE-2400G supports full 48V DC power for any remote IEEE 802.3af powered device (PD) such as Wireless LAN Access Point, IP phone, and IP Camera. Supporting full PoE power budget of 380 Watts, the POE-2400G provides sufficient 15.4 Watts PoE power to 24 remote PD devices. The POE-2400G is installed between a regular Ethernet Switch and the powered devices; it injects power to the PDs without affecting the data transmission performance. It offers a cost effective and quick solution to upgrade network system to IEEE 802.3af Power over Ethernet system without replacing the existing Ethernet Switch. There are 48 RJ-45 STP ports on the front panel of PoE Injector Hub, of which the 24 ports on the lower stack function as "Data input" and the other 24 ports on the upper stack function as "PoE (Data and Power) output". The 24 "PoE output" ports are also the power injectors which transmit DC Voltage to the CAT 3/4/5/5e/6 cable and transfer data and power simultaneously between the Injectors and Splitters. 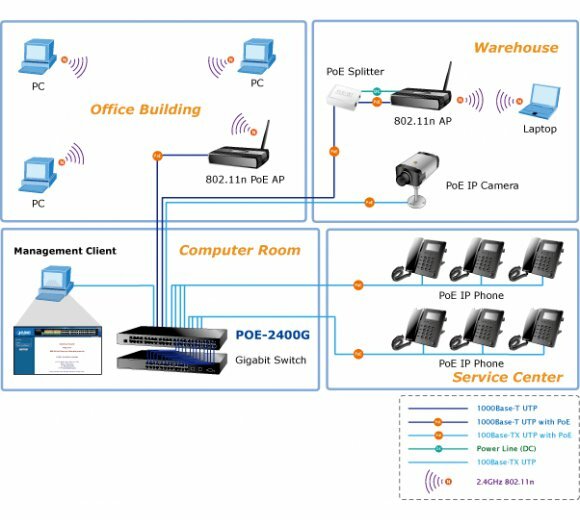 To efficiently manage the powered devices, the POE-2400G provides Web management interface in which administrators can control the functions including port Enable / Disable, port priority, system configuration, and Username / Password changing and smart features for powered devices. The PoE injector Hub can automatically detect the power status of each port and show massages on its Web management interface. These features also provide users a cost-effective way to manage the device via Internet whenever they are at work or at home. The POE-2400G provides the easiest way to power your Ethernet devices such as IP Camera on the ceiling and the Wireless Access Point installed on the top of the building. With 24 10/100/1000Base-TX Gigabit Ethernet ports, the POE-2400G supports full 48V DC power for any remote IEEE 802.3af powered device (PD). To control the power system of your networking devices, the POE-2400G can directly co-work with PoE IP phone to build VoIP telephony network in the office. 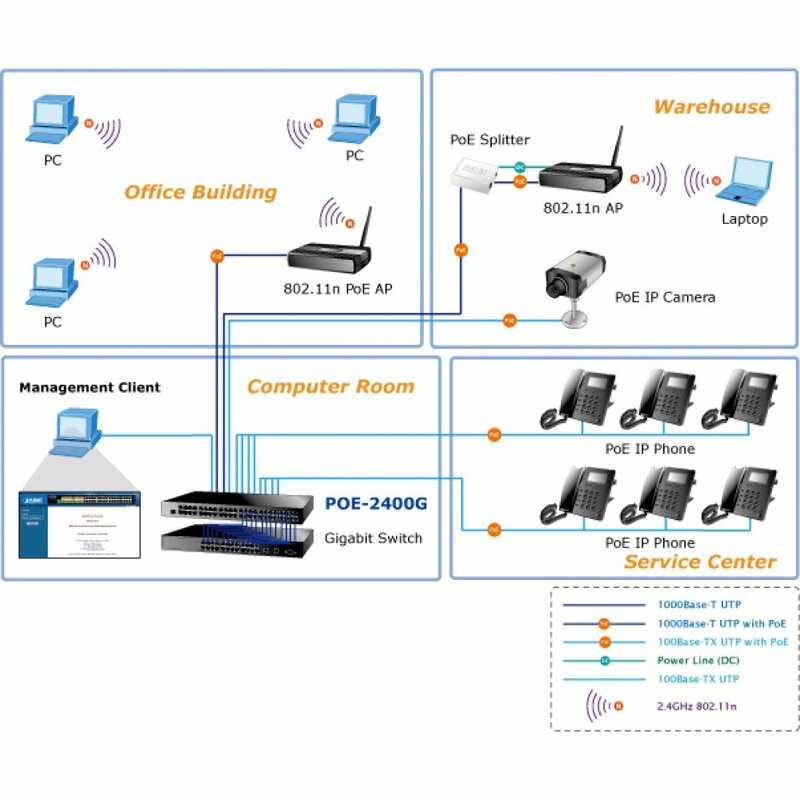 Furthermore, the POE-2400G can be directly connected to any third party IEEE 802.3af compliant devices installed 100 meters away.